Regular activity is very important for young cats - mental stimulation and physical activity are essential for the healthy development of their body and mind. Kittens also develop an important bond with their owners by playing with them and having fun. PDSA vet Vicki Larkham-Jones says: "Playing with your kitten will encourage natural behaviour, like stalking, and chasing. This behaviour should always be directed at inanimate objects, not other pets or people, so carefully selected kitten toys are ideal - allowing your kitten to develop natural hunting behaviours safely. This will also help them to keep fit and healthy and their brain alert and active." Using toys that move quickly and unpredictably will encourage chasing and hunting-type behaviour. Fishing rod-type toys are ideal for this, as are toys that move by themselves or ones that the cat can bat around. Just remember to keep your hands out of harm's way! Toys that make noises can be attractive, as well as those that are shiny or scented with catnip. 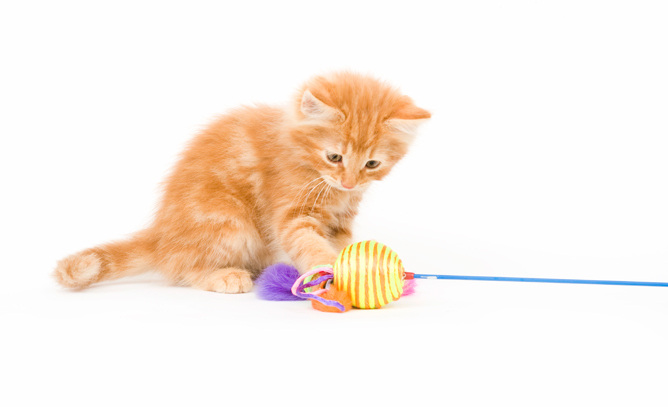 The toy should be small enough for the kitten to move around but not too small for your kitten to swallow, as these can pose a choking hazard or cause nasty blockages, which can be very dangerous. Feeder toys, where the food is placed in a ball or similar toy, make a cat 'work' for its food. Just make sure that any food is part of your kitten's daily allowance so they don't eat too much and put on weight. Cats love climbing and exploring, so kitten activity centres where they can safely climb, stretch and perch are also great fun. Never allow your kitten to play with wool or string - it can very easily be swallowed and get stuck in their intestines and around their tongue. As they grow into adults, cats still enjoy playing and will continue to benefit from the essential physical activity and mental stimulation that regular play provides.